Today's Brussels sprouts recipe: my fresh adaptation of a finalist in the 1966 Pillsbury Bakeoff. Start with fresh Brussels sprouts, cook gently and then glaze with a fruity jam and mix with water chestnuts and toasted nuts. Sound strange? Agreed -- but the Brussels sprouts are just delicious! Brussels sprouts with apricot glaze, what a winner, literally! This recipe was a finalist in the 1996 Pillsbury Bake-Off. I adapted the recipe for fresh Brussels sprouts but was completely amazed at how good the glaze-lemon-water chestnuts were. This is a keeper, great for Thanksgiving but a year-round choice as well. Bring the water to a boil in a large saucepan. Add sprouts, cover and adjust heat to maintain a slow simmer. 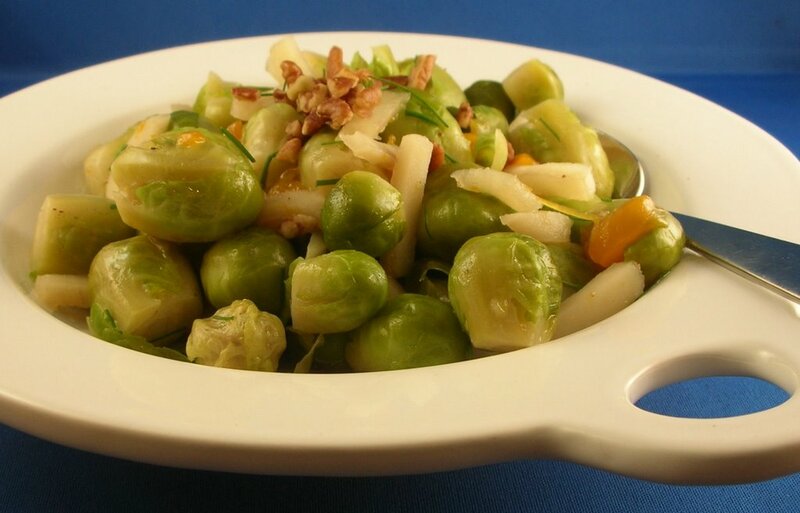 Cook for about 20 minutes or until Brussels sprouts are fully cooked but still bright green. Drain and return to the hot saucepan. Meanwhile, bring the glaze ingredients to a boil in a small saucepan. Pour over hot, cooked sprouts and stir to coat well. [You could pause for a few minutes here but cover to keep the sprouts hot.] Transfer to a serving dish. Top with toasted nuts. To salt water for boiling vegetables, Epicurious recommends a scant teaspoon of table salt (more if you only have the less salty sea salt) per quart (four cups) of water but I use about double that. A good cook-ahead trick for any vegetables cooked or steamed in water: bring the water to a boil ahead of time, say 30 minutes or so, then cover and turn off the fire. When you're ready to bring the water to boil for real, it'll take far less time. This is sure an intriguing recipe, it never would occur to me to prepare my sprouts this way! Oh, this is a good quest. A very, very good quest. The problem? I'm going to end up with a table filled with Thanksgiving vegetables. All sides, no main course. Actually, now that I think about it, that wouldn't be such a bad way to go about celebrating the holiday! This recipe looks delicious. I'm really intrigued by the fig jam option...but I am a huge fan of apricot jam, too. Two batches, perhaps? I love brussel sprouts and this recipe sounds intriguing Alanna! May have to try it for Thanksgiving. Ilva ~ Me either! I've had them sweet before (can't find that recipe, darn it!) but here, it's the crazy water chestnuts that make this a stand-out. Jeff ~ Bitterness. Hmm, really? Have you had small ones, no more than an inch across? Genie ~ Thank you! All vegetables? okay by me! You might want to check w the turkey fans, however ... oh, and I wouldn't worry about the jam so much. I would maybe avoid berry jams that would stain and somehow don't seem right, but marmalade, or a jalapeno pepper jelly, anything densely sweet, will work. Bruno ~ Let me know how it goes! Scott ~ Brussels sprouts are traditional for Christmas at my house too (along with roast beef, Yorkshire pudding and trifle for dessert ... yes, there's English blood in these veins!) but luckily, we can get them nearly year-round, about now straight from the stalk so they're really fresh. Oh dear! After going through recipe after recipe the last few weeks, I thought I'd had my Thanksgiving menu planned. And now... I may just have to wait a few days to really cement the menu.